Yesterday, Dewi sms-ed to report after her meeting with a potential corporate participant for the International Coastal Cleanup Singapore (ICCS). It did go off well although he was quite confused about the relationship between ICCS, Raffles Museum, NUS and Toddycats. Luckily she did not add that she is part of the ICCS Otters - the group that coordinates all the organisers! Since she called to report and I was heading down to the National Archives of Singapore in a hurry, I grabbed cab and picked her after she jumped off train at Commonwealth MRT. We chatted on the way down and shared a rare 15 minutes at Funan, which, of course we stretched to 30 minutes. Since we ended up next to Anderson's, it was inevitable - Dewi resisted but eventually you see her eating some banana flavoured ice-cream and seemed as happy as a Cheshire cat. We covered the ICCS points, the Toddycats strategy, t-shirt and gathering. Then we rushed off to our appointments in Bugis and NAS. 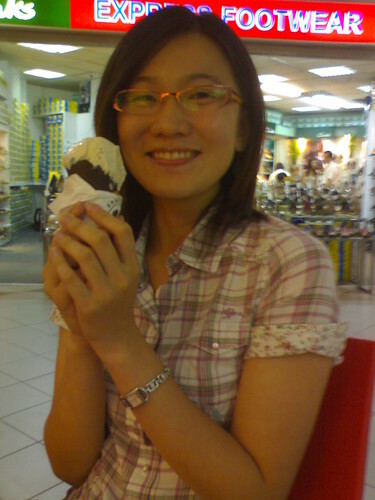 All that productivity was a bonus - it was simply fun to eat ice-cream with a Toddycat, in town, for once! Posted at 10:00AM UTC by N. Sivasothi | permalink | , .